Today I am bringing you a yummy soup recipe. I’ve been making this soup for quite some years now and it is a hit with my family. When I told my mom and sister I was making a batch of this soup my mom said she wished she lived nearer so she could have some and my sister asked when she could come get a bowl haha. This recipe was inspired by a restaurant that’s no longer in Edmonton called That’s Aroma! They had a garlic soup on their menu and it was so tasty. So this is my version of that soup. If you want to make this a vegetarian soup you could substitute the chicken broth for vegetable broth. Ps this makes A LOT of soup! I use my biggest pot and it’s nearly full. I’d say it’s around 4L of soup in the end. – Chop onion, put oil in big pot and sauté onion. – While the onion cooks chop the zucchini and green pepper into about 1/2 inch pieces and set aside. – Peel garlic and cut into thin slices. – Add spices to the onion and stir. – Add garlic to pot and stir for about 1 minute then add other veggies. – If your using fresh tomatoes chop them about the same size as the zucchini and pepper; if your using canned diced tomatoes drain them then add to the pot. – Drain and rinse the chick peas and add to the pot. – Add broth to pot then bring to a simmer with the lid on and allow to simmer for about 30-40 minutes until the veggies are cooked. – Add the whipping cream then bring back up to a simmer slowly. – Adjust salt and pepper as needed. I can’t believe I stumbled upon this! 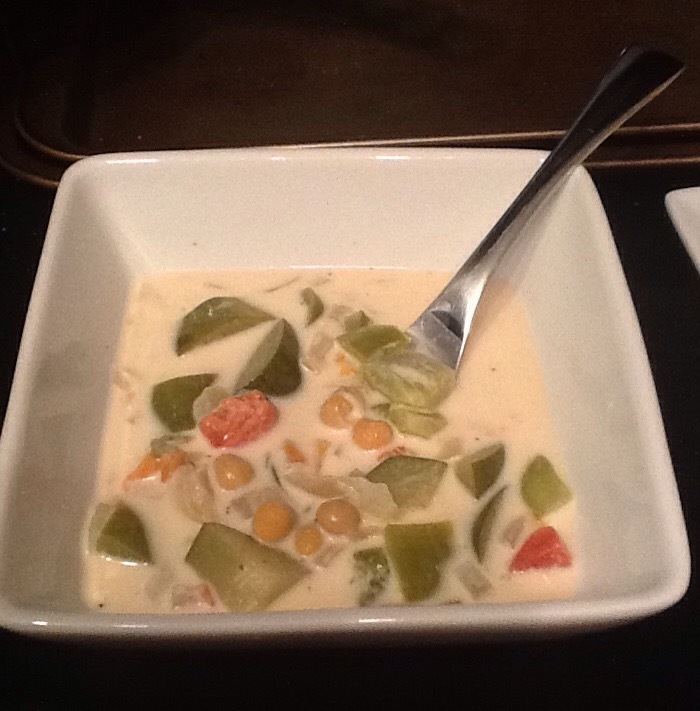 I was looking for That’s Aromas recipe as I was craving this soup after years of absence. Thanks for posting it! You’re very welcome! I hope it turns out just as good as you remember it 🙂 Let me know if you have any feed back. We loved That’s Aroma when we lived in Edmonton. Any idea how to make the Garlic Pasta that they served? That was my favourite pasta there! It’s been so long since I’ve had it. I’ve tried in the past to recreate it but it’s been a few years. I do know that they used oyster sauce and a little bit of sesame oil. I hope that helps.